Apparently there is an “Emotional Thesaurus” out there to help writers describe their character’s emotions. It’s too too easy to slip into using the same phrases over and over again. Just think of the omnipresent F word, used as a verb, a noun, and adjective, an adverb, and an expletive. Of course, she also uses this when a flower arrives for her, or she brushes her teeth with a new toothpaste, or perhaps discovers that computers exist. Someone, somewhere, is feverishly underlining in yellow (or pink, always a favourite) choice words in this emotional thesaurus, priming them for use in the very next novel they write. It’s like those word a day calendars, where immediately people think they have to work words like intussusception into the most casual of conversations. I foresee acres of FEELINGS, per page 34. See, the writers I like to read, and aspire to write like, don’t, I think, look in a thesaurus for feelings. They sit at their keyboards and intussuscept themselves into their characters. They put themselves in their character’s situation and let the feelings wash over them. They wallow a bit, chew over the bits that they can’t quite swallow (don’t you adore all these mixed metaphors? ), gulp the tough ones back, and then (forgive me) regurgitate them onto the page. They FEEL the feelings, even if they are damp and perhaps a bit smelly. How else can you explain how people like Helen Humphreys or Neil Gaiman or Alice Munro or Denise Mina or countless others pull our souls along with them on their literary ride? It’s not a recipe, folks, this writing thing. Otherwise there’d be a Kraft Dinner box with bright yellow and blue lettering with “just add some nutrition” on the back. 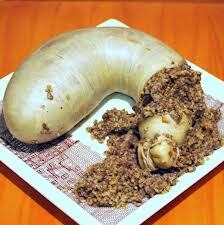 I’d say it’s more like haggis.